It is very important to understand that Shinran Shonin did not consider the Primal Vow and the teaching explaining it, to be just a path among the many Mahayana methods, but the supreme Buddhist vehicle, the One Vehicle of the Primal Vow (Universal Vow), the most important teaching of all Buddhas, the true, hidden reason for their coming to this world. "Respectfully I proclaim to all aspirants of Birth: The ocean of the One Vehicle of the Universal Vow"
„When I ponder the ocean of the One Vehicle of the Primal Vow, I see that it is the all-merging, perfect, unhindered, absolute, and unparalleled teaching that brings about the quickest effect". "Know that because the One Vehicle of the Primal Vow is the ultimate sudden teaching, the teaching of sudden and instantaneous attainment, the perfectly fulfilled teaching, and the consummate teaching, it is the absolute and incomparable teaching, the path of true reality or suchness. It is the single within the single, the sudden within the sudden, the true within the true, the consummate within the consummate. The One Vehicle that is true reality is the ocean of the great Vow. It is the supreme, rare practice." Why is it "the ultimate sudden teaching" or "teaching of sudden and instantaneous attainment"? Because through this teaching we will attain perfect Enlightenment in the very moment of our birth in the Pure Land. This is also the reason why it is "the path of true reality or suchness" and "the One Vehicle that is true reality". If we enter the Pure Land of Amida Buddha through the gate of the Primal Vow, we immediately attain true reality or suchness, that is Dharmakaya of Buddha nature. Why is it the „unparalleled teaching”, "the perfectly fulfilled teaching, the consummate teaching" and "the absolute and incomparable teaching"? Should entrust ourselves to the Tathagata’s words of truth”. "Truly we know, then, that the crucial matter for which the Great Sage, the World-honored One, appeared in this world was to reveal the true benefit of the compassionate Vow and to declare it to be the direct teaching of the Tathagatas. The essential purport of this great compassion is to teach the immediate attainment of Birth by foolish beings. Thus, looking into the essence of the teachings of the Buddhas, we find that the true and fundamental intent for which all the Tathagatas, past, present, and future, appear in this world, is solely to teach the inconceivable Vow of Amida". 'It is the single within the single, the sudden within the sudden, the true within the true, the consummate within the consummate" because no other Dharma gate or Buddhist path can compare with the Primal Vow. Among all the sudden teachings this is the most sudden, as no other path brings sentient beings to ultimate realization so quickly like the Primal Vow. It is the "true within the true" because even if all Buddhist paths are true paths (non-buddhist teachings are all partially or completely false) among them, the Primal Vow of Amida Buddha is the true intent of all Buddha's enlightened activities. "It is the supreme, rare practice" because, according to the 17th Vow, all Buddhas say the Name of Amida Buddha and encourage us to say it. "the merit of the inner realization of Tathagata Amida and His external activities, as well as the merit of Buddha Shakyamuni's extremely profound teachings, which are as numerous as the grains of sand in the Ganges". Because, "all of the merits of the teachings, the meditative practices on the phenomenal aspect of reality and the noumenal principle, the unmatched power acquired through meditation and wisdom, the wisdom of inner realization, and the merit of external activities, as well as all of the virtues and undefiled Enlightenment of Tathagata Amida, Bodhisattva Avalokitesvara, Bodhisattva Mahasthamaprapta, Bodhisattva Samanthabhadra, Bodhisattva Manjusri, Bodhisattva Ksitigarbha, Nagarjuna, and the Bodhisattvas and Sravakas of the Pure Land are encompassed in the three characters of the Name of Amida". "Know that the Buddha has gathered all roots of good into the three syllables, A-MI-DA, so that to say the Name, Namo Amida Butsu, is to adorn the Pure Land." 'Deep mind is the deeply entrusting mind. There are two aspects. The first is to believe deeply and decidedly that you are in actuality a foolish being of karmic evil caught in birth and death, ever sinking and ever wandering in transmigration from innumerable kalpas in the past, with never a condition that would lead to emancipation. The second is to believe deeply and decidedly that Amida Buddha's Forty-eight Vows grasp sentient beings, and that allowing yourself to be carried by the power of the Vow without any doubt or apprehension, you will attain Birth'". The deeply entrusting mind expounded above is the diamondlike mind that is the consummation of Other Power, the ocean of true and real shinjin that is the supreme One Vehicle." "To begin, the teaching of the Pure Land way is found in the Larger Sutra of Immeasurable Life. 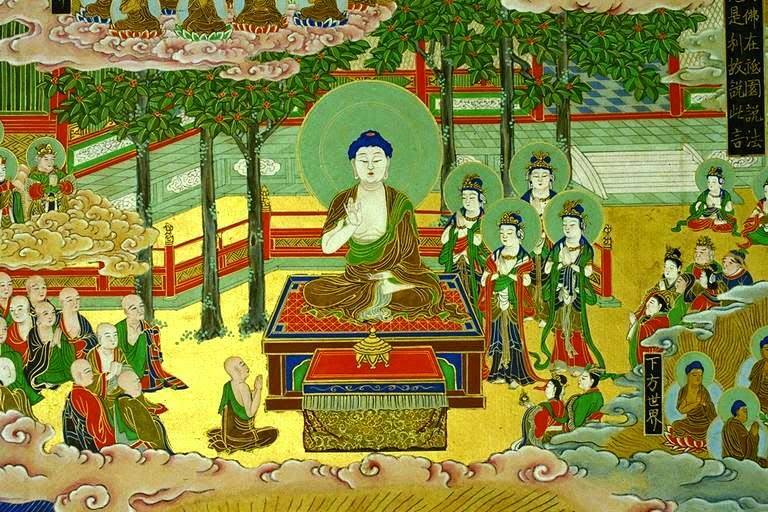 The central purport of this sutra is that Amida, by establishing the incomparable Vows, has opened wide the Dharma-storehouse, and full of compassion for small, foolish beings, selects and bestows the treasure of virtues. It reveals that Shakyamuni appeared in this world and expounded the teachings of the way to Enlightenment, seeking to save the multitudes of living beings by blessing them with the benefit that is true and real. Assuredly this sutra is the true teaching for which the Tathagata appeared in the world. It is the wondrous scripture, rare and most excellent. It is the conclusive and ultimate exposition of the One Vehicle. It is the right teaching, praised by all the Buddhas throughout the ten quarters. To teach Tathagata's Primal Vow is the true intent of this sutra; the Name of the Buddha is its essence”. “The Larger Sutra reveals the true teaching. It is indeed the right exposition for which the Tathagata appeared in the world, the wondrous scripture rare and most excellent, the conclusive and ultimate exposition of the One Vehicle, the precious words disclosing perfect, instantaneous fulfillment, the sincere words praised by all the Buddhas throughout the ten quarters, the true teaching in consummate readiness for the beings of this day. Let this be known”. 1) The first turning of the Wheel of Dharma happened when Shakyamuni taught the Four Noble Truths and other elements found in some of His early discourses. This is mainly concerned with abandoning negative actions of the body, speech and mind and is considered to be the Hinayana Vehicle (Smaller Vehicle) because it aims at the self-purification and self-liberation from the cycle of the repeated births and deaths. 2) The second turning of the Wheel of Dharma emphasized emptiness of self and phenomena as explained in the Prajnaparamita sutras, as well as compassion which naturally arises out of a genuine understanding of emptiness. 3) The third turning of the Wheel of Dharma comprises sutras like Mahaparinirvana Sutra, Avatamsaka Sutra, Lankavatara Sutra, etc, where Shakyamuni explained that all sentient beings have Buddha nature (Tathagatagarbha doctrine) and the potential to become Buddhas. It also teaches the abandonment of the clinging to emptiness. The 2nd and 3rd turning of the Wheel of Dharma constitute the Mahayana Vehicle (Greater Vehicle) because it aims at the liberation of all beings, not only of oneself. 4) The fourth turning of the Wheel of Dharma is referred by Vajrayana or Esoteric Schools as the Tantric teachings. The Vajrayana considers the previous three turnings of the Wheel of Dharma as belonging to the sutras. In comparison with them, the tantras contain esoteric and secret practices which supposedly can help very advanced practitioners to attain Buddhahood in this present body. We cannot separate the Vajrayana vehicle of the tantras from Mahayana because the aspiration to become a Buddha for all beings, as well as all the main teachings on Buddha nature and emptiness are also present in the Vajrayana. We can rather say that Vajrayana is a development of Mahayana with different emphasis on views and practice. I do not wish to enter into details about each of the above turnings of the Wheel of Dharma, or their various interpretations in different schools because these are not important for the goal of this book, so please refer to knowledgeable scholars if you are interested in this matter. The most important thing for us, followers of the Primal Vow, is that such a classification is not ultimate. In the light of the previous explanations and passages from Shinran Shonin, we can safely say that there was another and more important turning of the Wheel of Dharma - the teaching offered by Shakyamuni Buddha in the Larger Sutra in which He told the story of Amida Buddha and His way of indiscriminative salvation of all sentient beings (the Primal Vow). Thus, I think it’s safe to call this sutra the fifth turning of the Wheel of Dharma or better, the Most Important Turning of the Wheel of Dharma. This supreme turning of the Wheel of Dharma constitutes the One Vehicle of the Primal Vow. "One should have an unshakable faith in the passage from the Smaller Sutra that states that all Buddhas in the ten directions, as numerous as the grains of sand in the Ganges, testified and encouraged all sentient beings to attain birth in the Pure Land." "All the Buddhas in the ten directions, fearing disbelief in the teaching of the sole Buddha, Shakyamuni, with the same heart and at the same time extended their tongues, enveloped the three thousand great-thousand worlds, and said these sincere words, 'All sentient beings should believe in the teachings preached, praised, and validated by Buddha Shakyamuni. All common people must believe that regardless of the balance of vice and virtue and regardless of the time spent reciting nembutsu - once, ten times, for one day, or for seven days up to one hundred years - if one utters the Name of Amida Buddha from the depth of one's heart, birth in the Pure Land will certainly be possible. The Buddhas averred that you must not doubt this'"
"In the giving of witness to the Primal Vow, there are three Buddha- bodies. The witness of transformed bodies (Nirmanakaya Buddhas); this refers to Lokesvararaja Buddha." "I understand that that which is called 'the Vow that all Buddhas say the Name' and 'the Vow that all Buddhas praise the Name' is for the purpose of encouraging the sentient beings of the ten quarters to entrust themselves to Amida's Vow. Further, I have been taught that it fulfills the purpose of bringing to an end the doubting thought of the sentient beings of the ten quarters. This is understood to be the witness of the Buddhas of the ten quarters taught in the Amida Sutra." "The Light of Amida Buddha shines without exception over all the ten directions, and the innumerable Buddhas in the universe, in unison, praise the Name of Amida Buddha." Give the Name of Amida, urging them to entrust themselves to it". For birth there is the unsurpassed means." Are truly our compassionate father and mother. Supreme shinjin (faith) that is true and real." „The selected Primal Vow is the true essence of the Pure Land way. The true essence of the Pure Land way is the consummation of Mahayana Buddhism." The sudden teaching among sudden teachings." One vehicle” („Ichijo” in Jpn or „Ekayana” in Skrt) is the complete and supreme Dharma of the Buddha which provides the method of attaining Buddhahood quickly. Honen Shonin in his Commentary on the Three Sutras of Pure Land Buddhism; The Promise of Amida Buddha - Honen's Path to Bliss; English translation of the Genko edition of the works of Honen Shonin - Collected Teachings of Kurodani Shonin: The Japanese Anthology (Wago Toroku), translated by Joji Atone and Yoko Hayashi, Wisdom Publications, Boston, 2011, p.81. „The Buddha turned the Wheel of Dharma and gave all the various teachings of the Hinayana, the Mahayana, and the Vajrayana in different places with different people and at all different times. But also because He was teaching students of vastly different abilities, at times it seemed to them as if the Buddha was mainly spreading the Hinayana; at times it seemed to them as if He was teaching the Mahayana and sometimes as if to the Vajrayana. Of course, this was just a matter of the way in which the people were perceiving the teachings of the Buddha; it seemed to some that the Buddha was giving completely Hinayana teachings and to others that He was giving completely Mahayana teaching. The Buddha could also be somewhere else and through His miraculous powers giving other teachings to others. Because of this, some people started having the impression that the Buddha had only given the Hinayana teachings, and had not given the Mahayana teachings which were made up by someone else. Others believed that the Buddha had given the Mahayana teachings, but had not given the Vajrayana teachings and that these Vajrayana teachings had been fabricated by His followers. The belief that the Mahayana and the Vajrayana teachings were created by someone else is based on the belief the Buddha was just an ordinary man with no extraordinary qualities of Enlightenment instead of seeing a Buddha as being a very exceptional being who came into the world to help people out of His great compassion and to lead them to liberation. Once one thinks of the Buddha as an ordinary Indian man, then next one will have doubts as to whether He actually gave the various teachings attributed to Him and one begins picking and choosing between teachings of the various vehicles. "If one utters the Name of Amida Buddha from the depth of one's heart" means to say Amida's Name with an entrusting heart. This is the nembutsu of faith.